“Hi sir, you want ganja?” The red-eyed man poked his scraggly head and cracked palms through the space where the train’s door presumably once stood. Picking up weed in Sri Lanka, it seems, is easier than Jamaica. 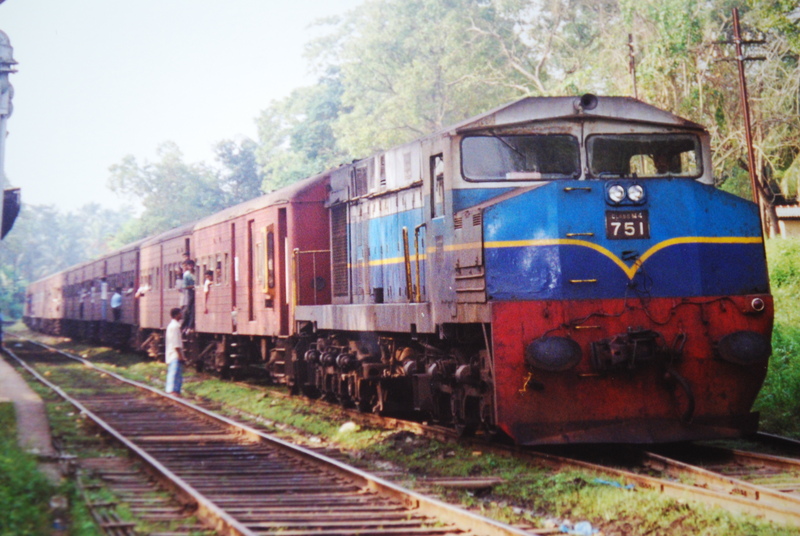 After a polite refusal, Thaksin introduced himself and stepped past me onto the Colombo to Hikkaduwa express. I returned to sitting on the open steps, staring outwards as palm tree jungles, buddhist shrines and cricket pitches rolled past. I was watching a farmer struggle to contain an unruly tribe of goats when I felt a tap on my shoulder and saw Thaksin’s right hand pointing at my battered blue leather bag. “Puma?” Thaksin had just proved he was literate, or at least recognised logos. “Yes.” I smiled back, unsure of whether I was required to further the conversation. He was grinning expectantly and clearly felt it was my duty to continue the dialogue. “Fred Perry.” I pointed at my plimsolls. He shrugged, unimpressed. “I have Puma trainers,” he announced. I glanced down. He was wearing mangled black sandals. I alighted at beautiful Hikkaduwa and Thaksin followed in his hunched shuffle. He had a full head of hair, two teeth and a winning smile that I couldn’t refuse. He showed me to his family’s guesthouse and gave me an en suite room for £3 a night, or £4.50 if you include the quarter bottle of local whisky he suggested I purchase on his behalf, which I classified as a finders fee. He informed me of a Buddhist celebration at the local temple that evening and encouraged me to accompany him. We agreed to meet at seven and he relieved me of a cigarette as he sloped out of the door, which I supposed was a light form of information tax. I returned from the beach at seven to find Thaksin staring wistfully into the distance, cradling an empty can of lager. May is the holiest time of year for Buddhas, he explained on the walk to the temple, and is marked by a month of festivities across the country. 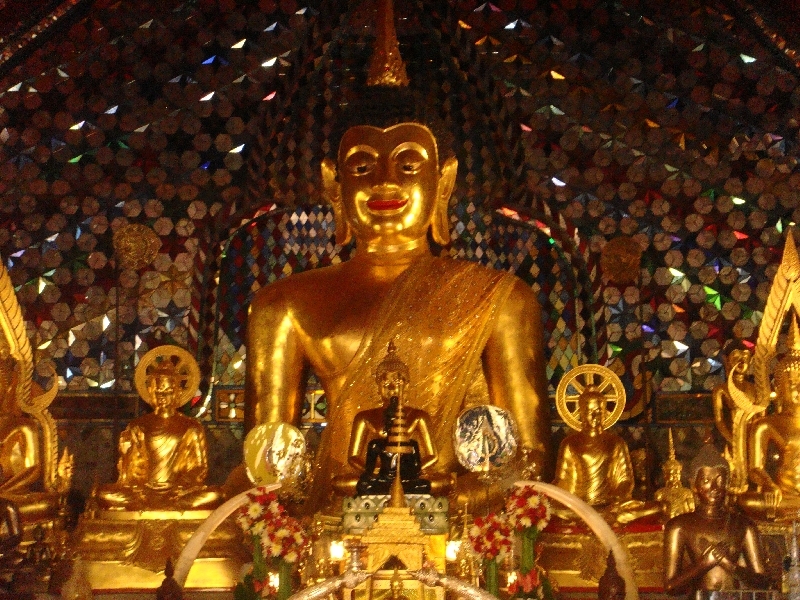 May is Buddha’s birthday, when he achieved enlightenment and also the month in which he died. 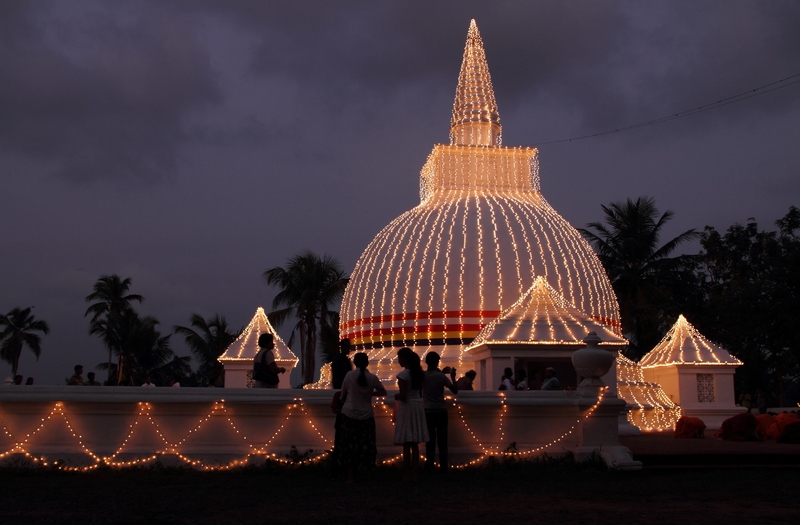 “Today is Hikkaduwa’s celebration of Buddha, your timing is very lucky. We should buy beer,” Thaksin suggested. I bought us two beers and felt it was an appropriate tax for my good fortune. It seems that in Sri Lanka, you are excised even more frequently than they are in Scandinavia. I enquired about Thaksin’s personal relationship with Buddha, curious about a man whose life was guided by a higher purpose than money and modern western ideals. Life is a series of pathways, Thaksin philosophised between giant gulps of Lion Lager, and there are good and bad pathways. Buddha never tells us which to take, but he appears to us through his teachings and offers guidance, he described. We arrived at a crossroads; one path thronged with Buddhists following a handpainted arrow pointing towards the temple, the other was a dirt track through a stagnant swamp with an equally informative red signpost, featuring a crocodile. “Sometimes, Buddha teaches us not to take the easy path. Hard work can bring great rewards,” he said. I didn’t like the direction this teaching was taking us. Without hesitation, he strode into the darkness and a single splash was quickly followed by several squelches. Call me cynical, or unenlightened, but I wondered whether traversing a crocodile infested swamp was more likely to lead to the loss of a limb than a blessing from Buddha. We emerged through some dense shrubbery and rejoined the marching buddhists just outside the entrance to the temple. My flip flops were dripping. “I need to bin this beer now, right?” I asked with a shake of my can, pretty sure that a central tenet of Buddhism was no mind-altering substances are welcome. There were also two policemen standing guard at the entrance. “No, not yet. Only when we enter the temples,” answered Thaksin. “Yes, I live here!” That was hard to argue with. I could sense the spirituality as I approached, and prepared to feel the warm embrace of inner peace and tranquility when I entered. GRAB! A policeman restrained me, snatching and locking my right arm at the same time. He was pointing incredulously at my left hand, which was clutching the can of lager. I was swung round one hundred and eighty degrees and frogmarched for three short steps until I arrived back on the other side of the entrance. It wasn’t quite as peaceful an introduction to Buddhism as I’d imagined. The policeman motioned at me to remain where I was. He strutted over to his colleague and they quickly became embroiled in deep conversation. On my left, I noticed a third policeman bounding towards them excitedly, a hyena sniffing out a fresh carcass. I sensed I was about to become a victim of blackmail and hurriedly transplanted my money from my pocket into the depths of my underwear as they returned. “You have drugs?” They began rifling through my pockets and found but a solitary packet of cigarettes. They regrouped and brainstormed possible bribes in frantic Sinhalese before approaching me again. “Three cigarettes?” Suggested the man I assumed was the sergeant. He was sporting a corrupt moustache, which lent him the look of a man who’s an expert in falsifying documents. Well, that sounds reasonable, I thought. 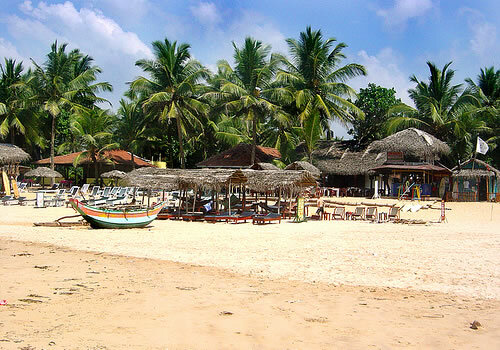 In Sri Lanka, it seems the hustlers charge a higher rate of tax than the police. I offered them each a cigarette and my lighter and they all accepted. Then, they stole my lighter. Transaction complete, the man with the moustache pushed me back over the threshold into a fairytale of temples and fairy lights. In Islam, if you contravene a central commandment you can get stoned to death. In Christianity, if you break the rules you’re sentenced to an afterlife of hell, fire and brimstone. In Buddhism, it will cost you three Lucky Strike; now, this is the religion for me.